"This country knows that if there is today a movement for the protection of environment it is spearheaded by judiciary and judiciary alone" said Justice TS Thakur. Reportedly, Justice Thakur was replying to Power and Coal Minister Piyush Goyal’s remarks, in which he had said that economic development should not be at the cost of environmental degradation, “However, it is very important to understand that sometime a judicial overreach or sensationalisation of a particular subject can cause more damage than growth." Mr. Piyush Goyal had added, “I believe pragmatic judicial review of the restrictions is necessary, it is the need of the hour to come to terms with whether our actions are actions to ostensibly save the environment." Taking on the remarks made by the Minister, Justice Thakur took the example of Ganga cleaning, a process that has been going on for almost two decades now, without much success. He said, "For 20 years the government has been cleaning Ganga and we all know the condition of the holy river after the campaign started, thousands of crores have gone down in the project." He added, "SG (Solicitor General) who is the conscience keeper in the environmental matters made an honest confession here that there is H2 (hydrogen) but not O (oxygen) in the water of the Yamuna." Adding that both the government and judiciary were concerned and wanted the same results, Justice Thakur said, “We are not at cross purpose, you (government) want the environment to be clean, we also want the environment to be clean.” Justice Thakur reportedly also said, “We sometimes have to transgress the lakshman rekha in our exuberance to clean environment. You (government) may like interpretation of law as per your perception, but we have an oath to interpret it as per the Constitution of India,”." Maintaining that each wing of the government should work to achieve the common goal, he said, “Please be rest assured that it is not that the courts are keen to take over government, the directions of protection of environment are issued because they (courts) consider this as one of the sacred constitutional duties that is enjoined upon us as the guardians of the Constitution.” He added, "With each one of us discharging his duties we should have no difficulty in allowing each one of us to act in our respective spirits." However, expressing the real problem, he said, "To our utter disappointment the report was that there was no plantation anywhere and our orders to plant 10 times more trees where in complete breach and yet crores of rupees had been said to have been spent on plantation." Hinting that judiciary will not mechanically tow the government’s line, "If you call this judicial overreach we can only say sorry it may continue for a long time." 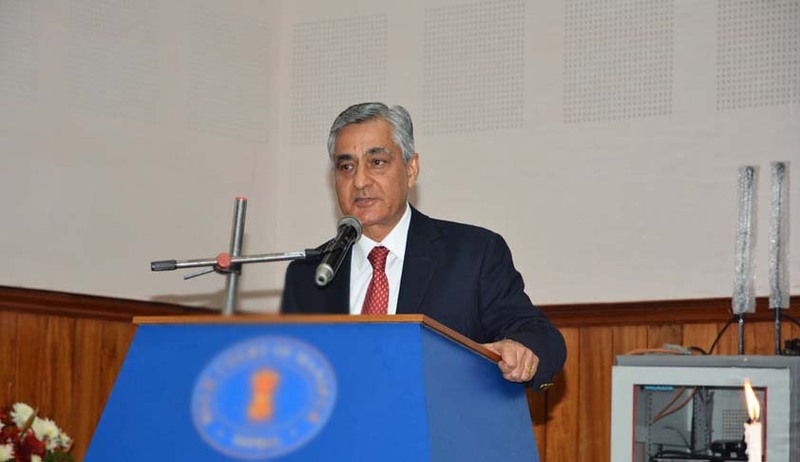 Justice Thakur also spoke about the floods in Kashmir, he said, "They came because the flood channels which were meant to take the excess water out of the Jhelum were blocked because of the government's inability to prevent encroachments." Highlighting the stand judiciary has been consistently taking for some time now, he said, “We have faced this criticism for a long time and it will continue but the judiciary does not get deterred by this criticism but it helps us in ensuring that the law takes its own course." You may also read Judicial Legislation – Boon or Bane?